Hills. 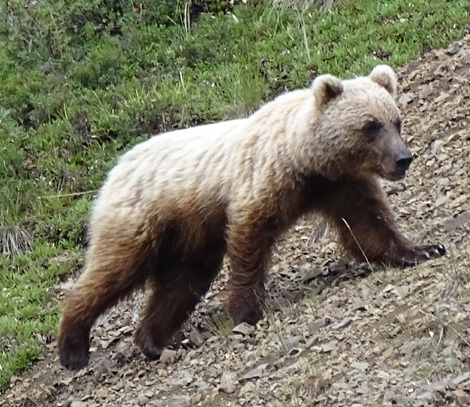 Now it is exclusively geared toward recreation and seasonal tourism." 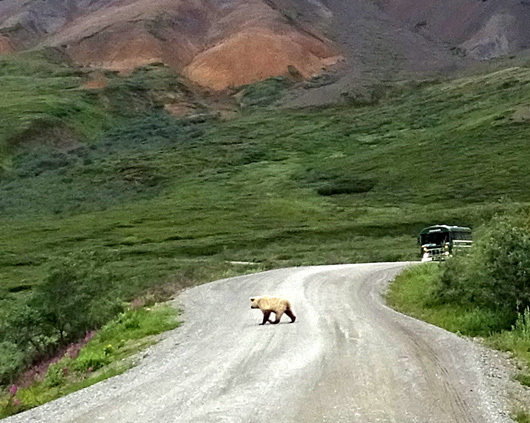 Located 92 miles into Denali National Park at the end of the only roadway in the park, Kantishna is a very long tour or shuttle bus ride. 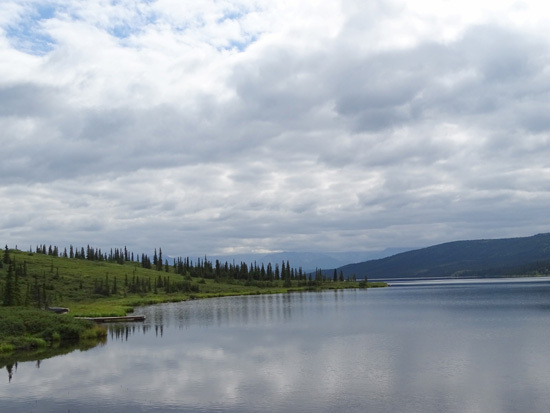 For that reason, Jim and I didn't go any further than Wonder Lake when we visited three years ago. 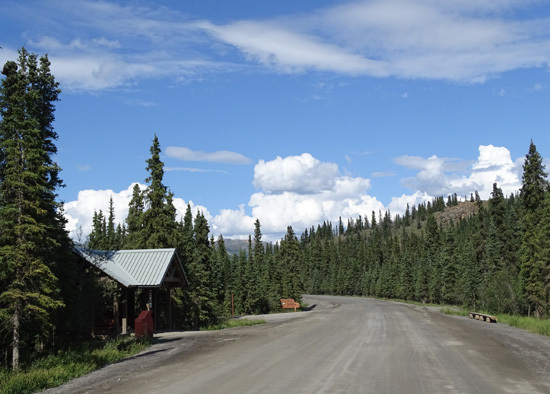 But I've been curious about the abandoned mining community ever since then and decided to continue just seven miles farther past Wonder Lake this time so I could see what I might have missed. And in order to save some money, 56 miles, and several hours on a bus . . . 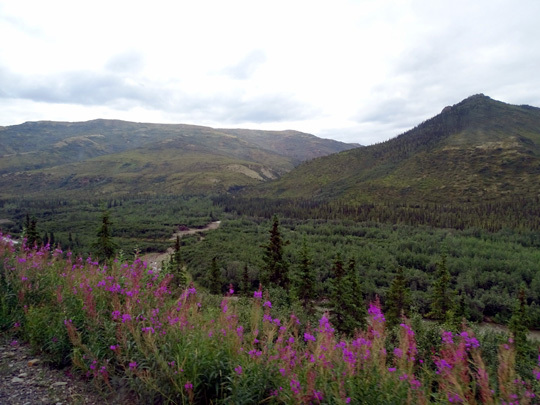 I rode out and back from Teklanika Campground on my Tek Pass instead of riding out and back from the entrance. 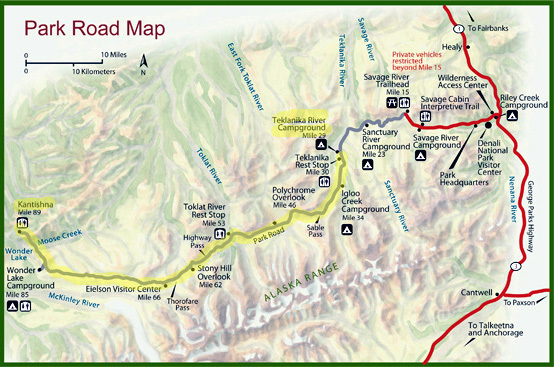 The Tek Pass is a nice perk for folks staying at the Teklanika AKA "Tek" Campground at Mile 29 on the park road. 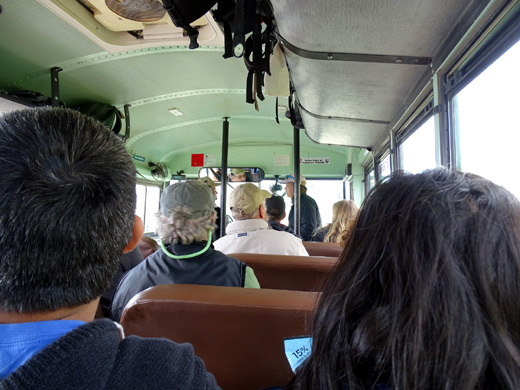 Campers can purchase a ticket for a shuttle bus ride on their first full day at Tek, then ride again on subsequent days that they are camped at Tek at no additional cost on a space-available basis. I paid for one ticket to Kantishna for today, then rode two more times out to Polychrome and the north end of Wonder Lake -- all for the cost of one ticket. in the lake but very few people get that opportunity because conditions have to be perfect. 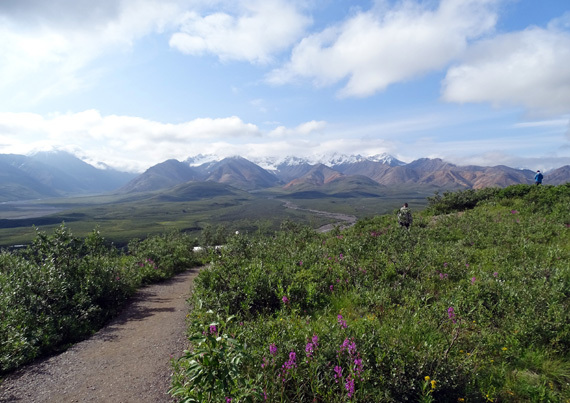 If I'd gotten a Kantishna ticket when we were staying at Riley Creek Campground near the park entrance, I would've had to pay for three separate tickets to do the same thing -- and I'd be on the buses a lot longer each time than starting and ending at Tek. This benefit is as good as any other reason for staying out at Tek for a few days. 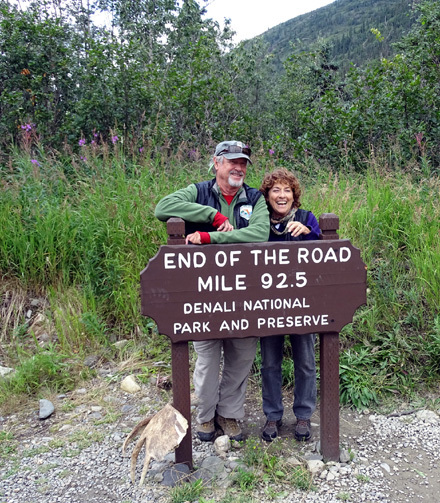 In addition, Jim was able to ride his bike from Mile 29 out as many miles farther as he wanted, getting to see scenery and wildlife he wouldn't have seen otherwise since he didn't want to ride the buses this time. I rode the first of two Kantishna buses to the end of the road for the first time. I thought there would be some old mine ruins but they're all gone. 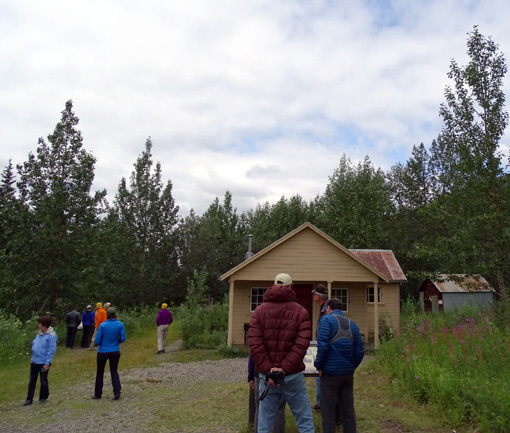 There is a cabin a woman lived in back when the brief gold rush occurred, an airport, and a turnaround for the buses. Just a couple small buildings have been maintained at the site. Photo op at Kantishna (I don't know this couple). 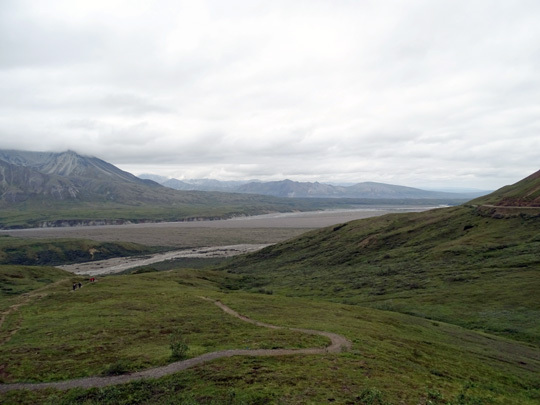 About 1,500 acres of land in that area are still in private hands. 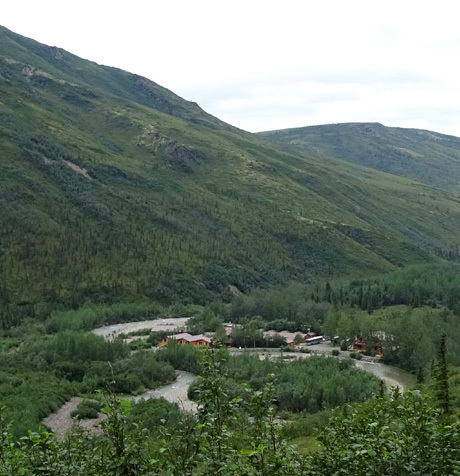 There are several roadhouses, inns, and cabins for visitors. There have been some recent problems with flooding in this area. 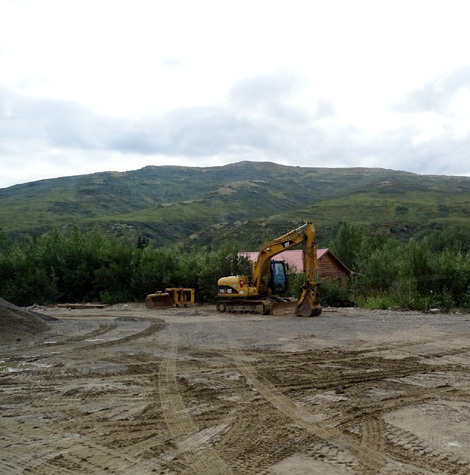 Sometimes the park road has been closed temporarily near Kantishna because of washouts and mud or rock slides. Even though Kantishna wasn't what I expected, I'm glad I went out there. What I liked best was seeing the rest of Wonder Lake and Reflection Pond, so much that I took a hike there the next day. The whole trip to Kanthisna today was great -- excellent bus driver who gave us a lot of information (the best I've experienced so far after five bus rides with seven different drivers), decent weather, some different scenery, lots of critter sightings, a good seat on the bus, and good traveling companions. 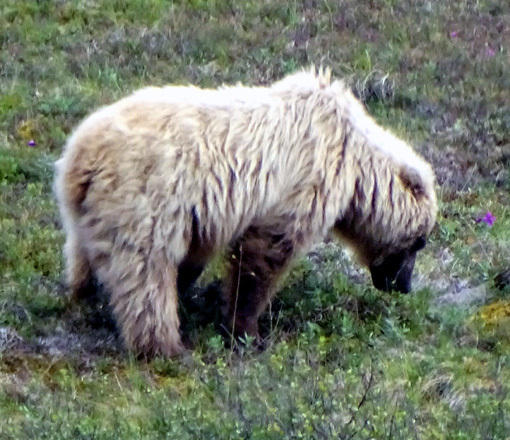 The only downside was not seeing Denali today -- at all. 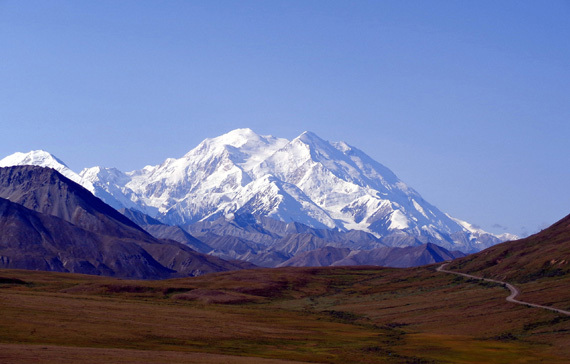 There were just too many clouds stuck over the Alaska Range all day. but you'd never know it today. The High One is not visible about 70% of the time. I thought there were three Kantishna buses but there are only two. The third shuttle bus that goes that far is a camper bus. I got out to the bus stop at Tek a little after 8 AM, hoping to ride the bus that was due to arrive there at 8:25. Turns out, it was a camper bus. The shuttle bus for which I had a guaranteed reservation was at 8:55. The camper bus driver said I'd be better off waiting for the 8:55 Kantishna bus because its driver gives such a good narration. 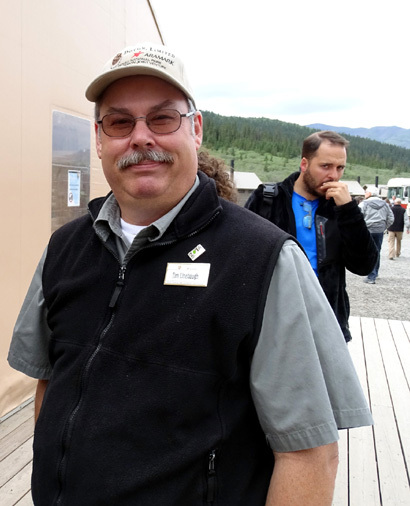 She was right -- Tim Linebaugh, pictured below, has been driving shuttle buses at the park for seventeen years and knows all the history, geology, and the most likely locations to observe various animals. He was so informative and personable that I sought out his bus the next two days when I could have ridden any shuttle bus to and fro. There are a lot of advantages to a Tek Pass, which I've already mentioned. The biggest disadvantage is getting on 29 miles after most of the other passengers have already boarded and having to sit in the back and/or in an aisle seat where it's difficult to take pictures in transit. I lucked out this morning, however. Fewer than 30 people were on the bus when I boarded. A seat on the door side in the fifth row was empty, so not only did I get a window seat, it was also near the front of the bus where it's a more comfortable ride and faster to get on and off at all the stops. I get nauseous in the back of a bus, where it's bumpier. I was a happy camper. I missed getting some of the scenic pictures to the south on the outbound ride but could get them on the return trip when my seat was on the correct side. I had that seat to myself all the way out to Kantishna and back home. There were folks from all over -- and no kids, thankfully. The couple in front of me were of Indian descent but live in CA. The two women behind me were from the Netherlands. There were folks from Germany, other European countries, and southeastern Asia. One of the American couples has a house in Missouri but travels in their RV most of the time, like we did for ten years. We found lots to talk about. CRITTER COUNT = NOT SURE I CAN COUNT THAT HIGH! 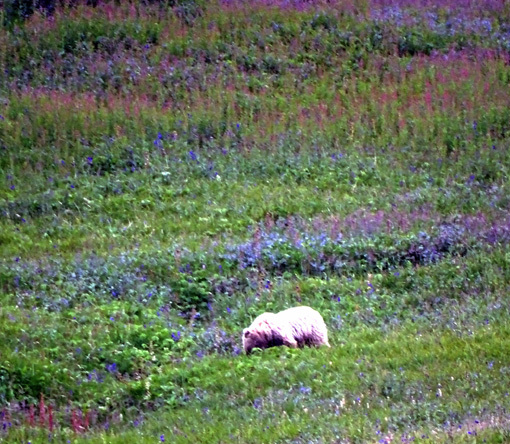 I think I saw more animals today than on any one previous bus ride at Denali. 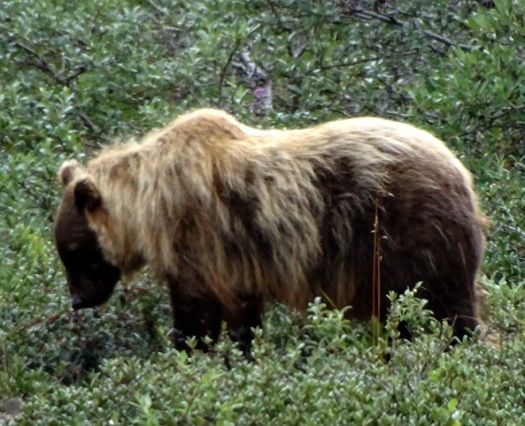 The folks who boarded at the entrance saw two moose and a bear before I got on. 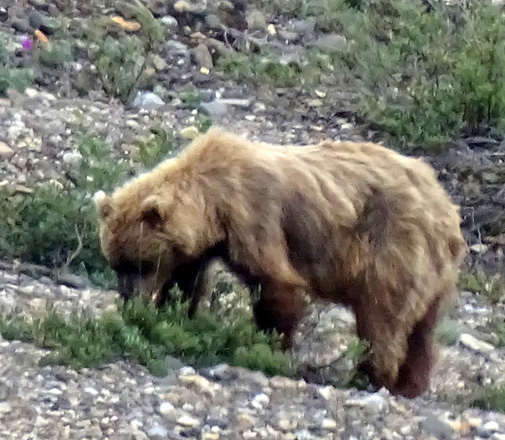 I missed those but during the day I saw lots of caribou (some very close), eight different adult grizzly bears (not as close but I could zoom in on them), a dozen Dahl sheep (far away), a shaggy coyote, and lots of loons, golden eagles, falcons, and other birds. 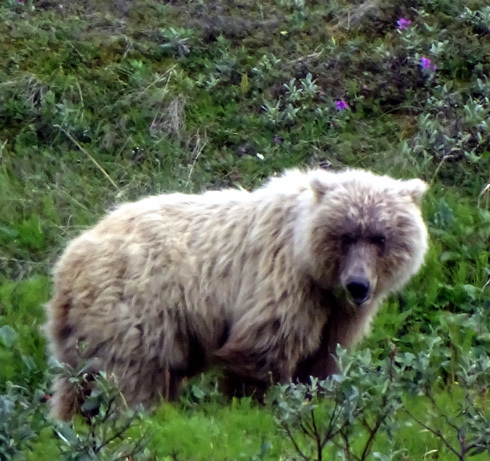 Here are some of the photos I shot from the window when the bus was stopped to view the animals. 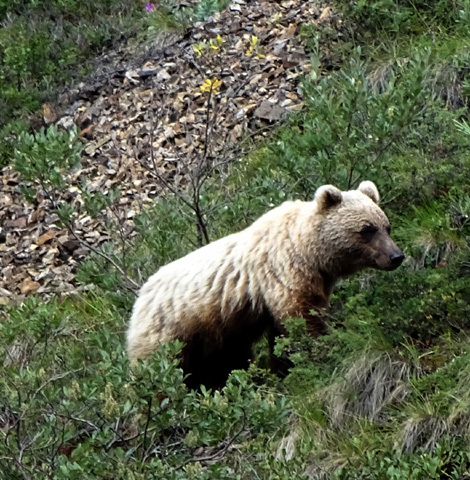 Since grizzly bears are probably at the top of everyone's list, I'll start with some of those. 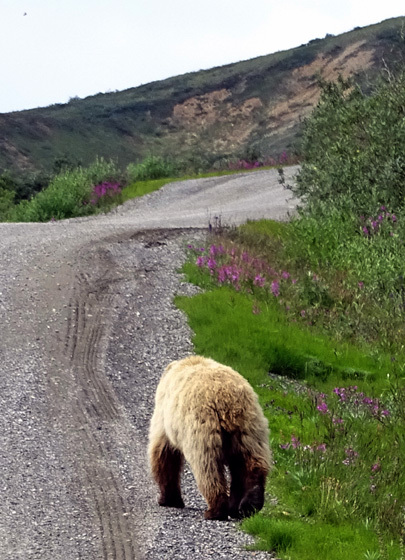 The next fella was sauntering down the road near Polychrome. 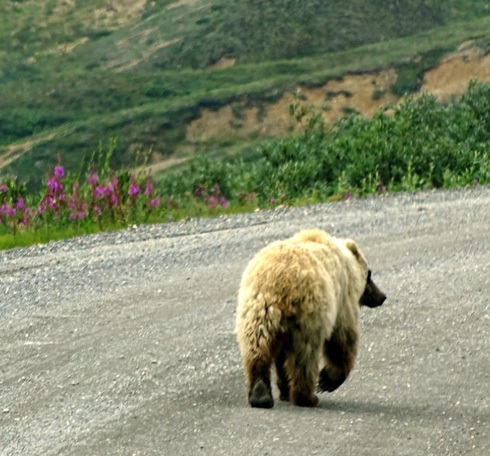 Several buses followed slowly behind him because wildlife in the road always has the right of way at Denali. 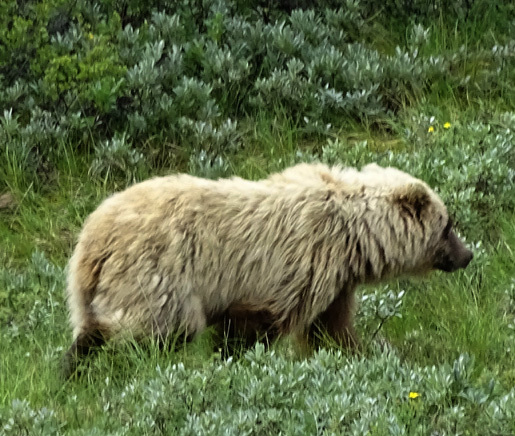 When I see bears, caribou, coyotes, and other wild animals shedding like this, I have the urge to brush out the undercoat! As if . 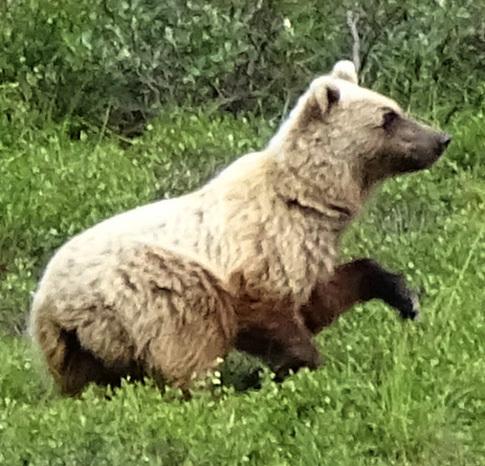 . .
Three years ago Jim and I had the pleasure of seeing several mama bears with one or more cubs at Denali but neither of us has seen any cubs yet.